Fr. Brian Linnane, S.J. is the president of Loyola University Maryland. Update on 04/19/17 at 5:04 PM: The entry for the National Organization for Women (NOW) has been removed from Loyola's web site. 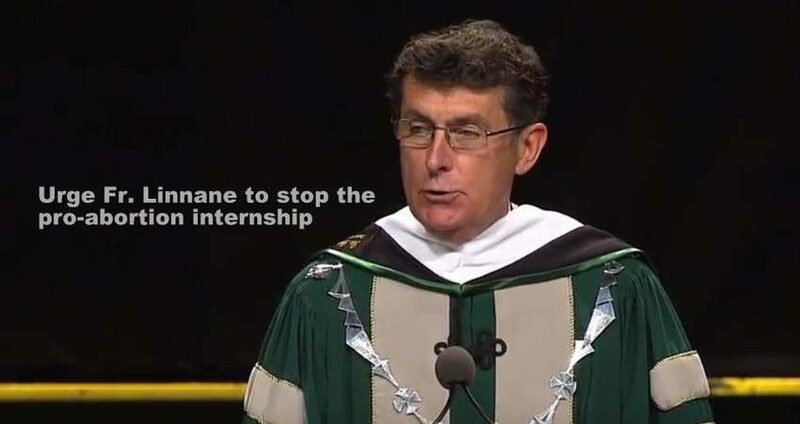 We are hoping the president of the university will issue a statement, assuring Catholics that pro-abortion internships will not be promoted in the future and that credits will not be offered for such internships. TFP Student Action thanks everyone who joined this peaceful and successful protest. May God bless all of you! 04/18/17: The Catholic Loyola University Maryland is offering internships with a radical pro-abortion group called the National Organization for Women (NOW). How can a Catholic university encourage students to work for a pro-abortion group like NOW? Sign and share this peaceful protest. God bless you. To Fr. Brian F. Linnane, S.J. I respectfully urge you to stop offering internships with the pro-abortion group National Organization for Women (NOW) at Loyola. Thank you.